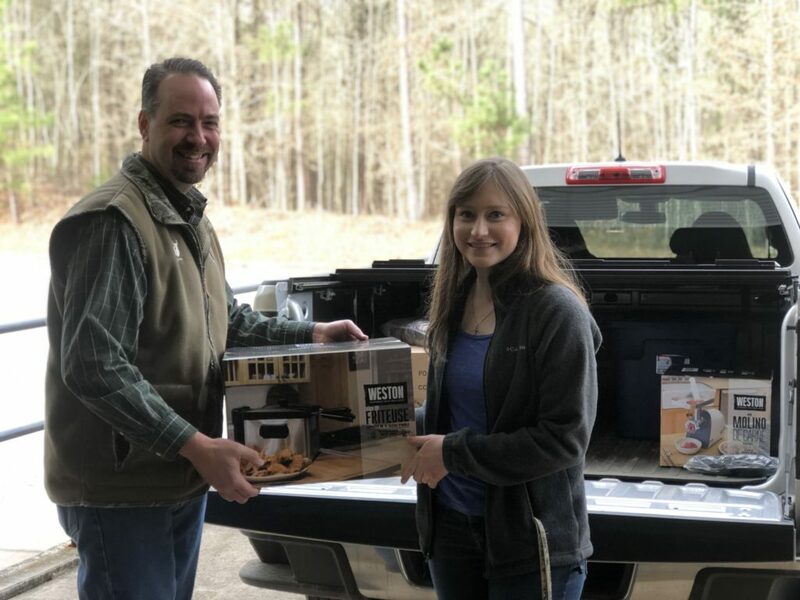 The Quality Deer Management Association donated multiple items to the UGA Deer Lab to be raffled as prizes for hunters participating in a survey. Pictured are John Eastman (left, QDMA Senior Director of Operations) and Jackie Rosenberger (right, UGA Deer Lab Masters Student) at the QDMA National Headquarters in Athens, GA. As part of the North Georgia Deer Project, the Deer Lab and Georgia Department of Natural Resources are conducting a survey of hunters to study their experiences and preferences for deer management in light of declining deer populations in the mountains. Hunters who completed questionnaires were automatically entered into a drawing to win a meat grinder, fryer, luggage set, jacket, or knife.